A Washington D.C. winter rarely sees 15.4 inches of snow, but that's the city's average annual snowfall. Washingtonians are more used to the two extremes: scarcely any, or way too much. WASHINGTON — A Washington D.C. winter rarely sees 15.4 inches of snow, but that’s the city’s average annual snowfall. Washingtonians are more used to the two extremes: scarcely any, or way too much. The mammoth snowstorms during the winter of 2009-2010 led to the region’s snowiest winter of all time. Since Snowmageddon, three winters have ended in above average snow for the District. The other three came to a close with just a few slushy inches on the books. The winter of 2011-2012 was one of the least snowy winters on record. 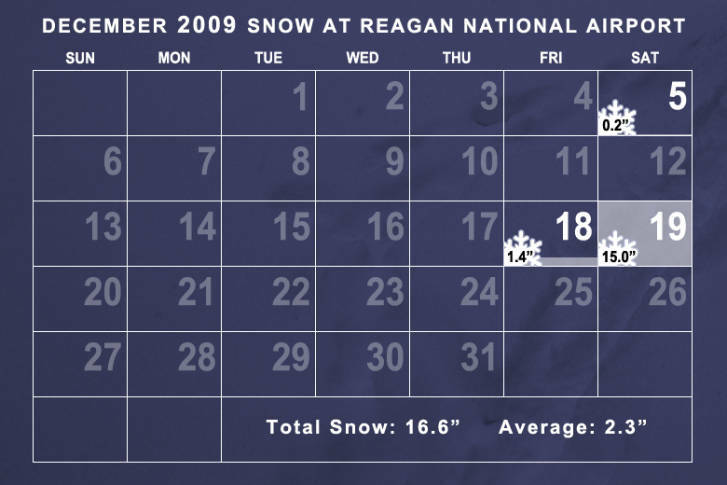 Most of D.C.’s snowfall occurs in late January and early February. The city averages 5.6 inches of snow in January and 5.7 inches in February. During these two months, locals can expect about three to six snowfalls. For more information the region’s blockbuster snowstorms, see Measuring up: A look back at the region’s snowiest winters. Editor’s Note: This gallery has been updated through November 2018. Like this story? Read more of WTOP’s Winter 2015 articles. And sign up for our email alerts to be notified of the latest school closings/delays, traffic incidents and other breaking news impacting your winter.